Part 1 of our most recent Taste of Terroir began in the Northern AVAs of the Willamette Valley, examining 2008 Pinot Noir from Oregon's Chehalem Mountains AVA and Ribbon Ridge. We also covered a little bit about the 2008 growing season in the Willamette Valley. You can read all that here. But time waits for no man, and so we must continue our journey South through the Willamette Valley and onto the Yahmill-Carlton District. The Yamill-Carlton District was designated an AVA in 2004. Its vineyards are predominantly planted on the south-facing slopes of the ridges that surround the district in what resembles a horseshoe pattern. In order for a vineyard to fall within the Yamhill-Carlton District AVA, not only must it be within the proper geographic location, but it must also be between 200 and 1,000 feet of elevation. The soil types are comprised mostly of marine sedimentary soils (Willakenzie), as well as some of the volcanic soils known as Jory. 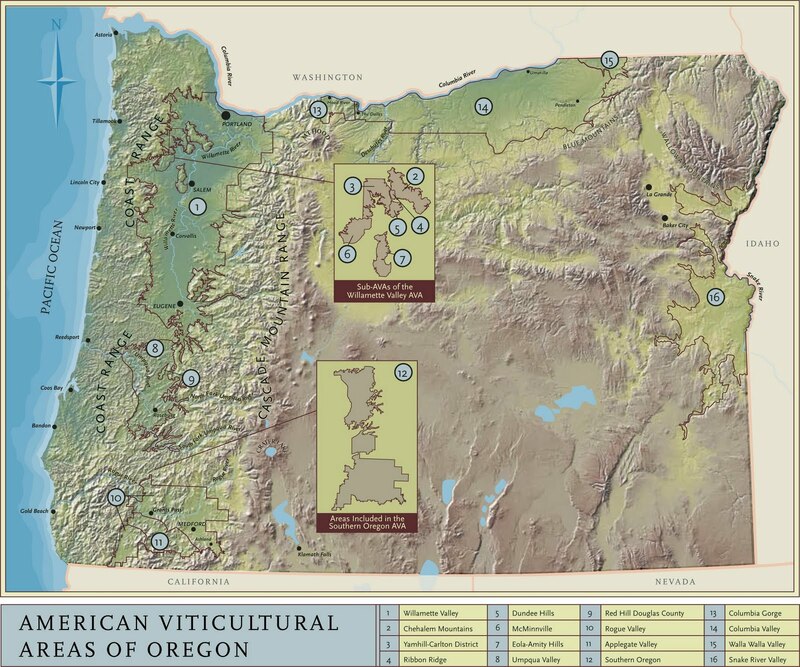 Yamhill-Carlton has some of the oldest soils in all the Willamette Valley. The Dundee Hills are probably the wheelhouse for visitors experiencing Willamette Valley. They’re located, right down the middle of the corridor and encompass some of the biggest names in all the Valley: Erath, Sokol Blosser, Argyle and Ponzi. When people think of Willamette Valley, whether they know it or not, they often think of Dundee Hills. The Dundee Hills is made up entirely of the Jory volcanic soil type and it's rich in both iron and a red hue that are a signature of the Dundee Hills. The AVA was designated in 2004 and it has 1,300 planted acres. The Dundee Hills are often thought to be a bit more protected weather wise than some of the surrounding areas, so a bit drier and warmer may certainly help in such a cool climate. The McMinnville AVA was designated in 2005 after a successful petition by Kevin Byrd of Youngberg Hill Vineyards. The AVA lies within the rain shadow created by Oregon's Coast Range and it therefore generally sees less rain than many of its neighboring AVAs The proximity to the Van Duzer corridor, and the coastal wind it brings, keeps the vineyard sites a bit drier. 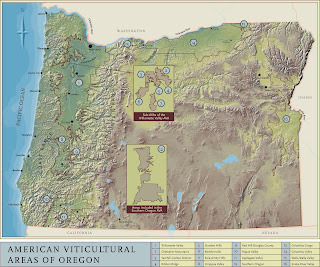 The soil composition is primarily marine sediment but basalt and volcanic soils also underlay much of the McMinnville AVA. Only 600 acres of vineyard are planted. Continuing south in the Willamette Valley, on towards Salem, we reach the Eola-Amity Hills AVA. The fruit of the the Eola-Amity is known for its almost pitch perfect acidity, higher than much of the Willamette Valley. Its proximity to the Van Duzer Corridor and those cooling winds from the Pacific play a major role in that acid retention. Designated in 2006, the AVA consists of mostly volcanic soils, as well as nekia, which is a soil comprised of exposed basalt. The Eola-Amity hills holds some of the most famed Pinot vineyards in the Willamette Valley, including Temperance Hills, Seven Springs, and Elton vineyards. Some of the signatures of the AVA include darker fruit profiles on both the palate and the aromatics of the wine. The Brooks Winery 2008 Rastaban Vineyard Pinot Noir is a deep, dark Pinot Noir. This wine had far darker fruit character than any of the other Pinots we tasted. It was a bolder wine, a big, luxuriant Pinot Noir. The oak program used on this wine, 50% new French for 18 months, resulted in aromas of smoke and earth and represents a bit of a departure from many of the Burgundian styled Pinots that Oregon is known for. This wine was a lot of dark rich velvet, and it retails at $50. Next, we did what many people consider the unthinkable: we left the Willamette Valley. We left it behind and continued south to the Umpqua Valley. The Umpqua Valley was designated in 1984, and contains the basin area of the Umpqua River. In conjunction with the much warmer Rogue Valley AVA, it makes up the Southern Oregon AVA, designated in 2004. The Umpqua Valley is warmer than the Willamette Valley and sees plantings of Pinot Noir, Pinot Gris, Chardonnay and Riesling and some occassional Cabernet Sauvignon. Most of those warm weather varietals grow beautifully in its neighbor to the South, the Rogue Valley AVA. The soil composition of the Umpqua Valley is often sand and clay loams. Our final and southernmost wine, the Brandbourg 2008 Ferris Wheel Estate Pinot Noir. This wine gave us a bit of toasty oak on the nose and certainly the palate held much more spice, with hints of chicory and cola than the Pinots to the North. While many of us found this Pinot slightly different than its neighbors, with its spicier fruit profile, this was still an elegant, balanced Pinot Noir and demonstrated capably that Pinot can, in fact, be grown outside the confines of Willamette Valley and still demonstrate great varietal integrity and beauty. This wine retails at around $30. 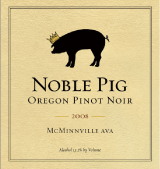 Our conclusion, the 2008 vintage is a great one for Oregon Pinot Noir fans. In many cases wineries are still releasing their 2008s, particularly when it comes to single vineyard Pinots. In other cases some of the 2008s have been completely sold out. The buzz about the vintage has had impact on both pricing and availability, but don't be deterred. Gather up and drink as much of it as you can, you'll thank us later.